1. Soludos Espadrille Sandals - I love Soludos and they have really expanded their assortment over the years. These would be adorable paired with a flowy white dress or denim cut-offs and a classic white tee. 2. Michael Michael Kors Wedge Sandal - Maxi dresses need a great wedge sandal and these are definitely high enough to wear with dresses that need a bit of a lift. 3. Sam Edelman Gigi Flat Sandals - I love the simplicity of these sandals, and they come in almost every shade imaginable. 4. Loeffler Randall Suze Sandals - While the previous sandals are the epitome of simplicity, these are a party for your feet. 5. 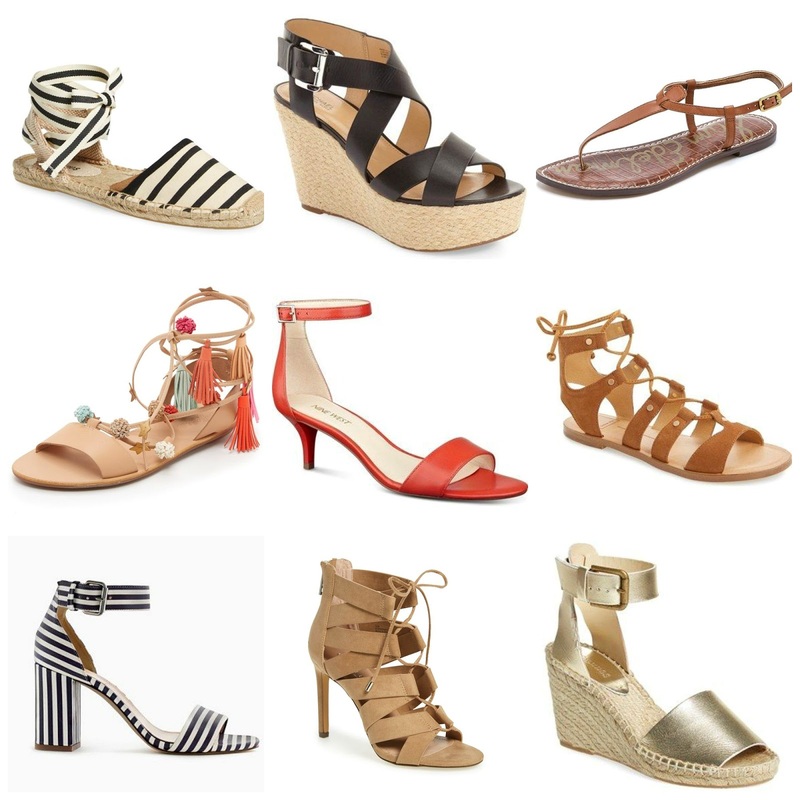 Nine West Ankle Strap Sandals - One of the most versatile pair of sandals in the bunch, I see them being worn with a casual sun dress or dressed up for a night out. 6. Dolce Vita Ghillie Sandals - Gladiator sandals are still on trend, but sometimes they can be a bit too busy. This is a take on the trend but a bit less busy and more classic. 7. J.Crew Striped Strappy Sandals - Anything striped I want to wear - and these blue and white striped sandals are quintessentially J. Crew. Jeans, dresses, shorts - there is not much that won't work with these sandals. 8. Charles by Charles David Lace-Up Sandal - Major sass with these sandals, but since they come in a neutral shade it's not as intimidating. 9. Soludos Espadrille Wedges - Metallics are a neutral in my book so I would wear these wedges with almost anything in my closet. Bonus that they are a manageable height.